Interview conducted at Homewood, Williamsport, March 11, 2011. Interviewer - John Frye. Interviewees - Sue Hoch, Robert May, Jack Myers, Charles South, and Maurice Snyder. John: Both the creek and the river flooded about the same, didn’t they or did it back up in the creek? John: That was in the Tannery? Maurice: That was in the Tannery And the tannery and the brick yard and the whole are that went up towards Clear Spring, part of the way up that hill and coming up to Williamsport. There was a red building down there and across from there was a fellow who cut hair called Joe Grove. John: The 68 bridge was clear under. Correct? You could not tell the bridge was there? Maurice: When you went half up that hill you were under too. John: Jack where were you at the time of the flood? Do you remember it at all? Jack: Oh yes. I remember it all. I lived on Fenton Street. Our house was right at the edge of Cushwa’s brick yard. I remember it well. The flood came up. It flooded the brickyard, it flooded the tannery. Like Maurice said we were almost surrounded by water. I can still hear the , you know the brickyard had what we called kilns where they burnt their bricks and they burnt the clay to make bricks. Well, the flood came up and hit that fire, it was hot, the kilns were hot, and it is hard to describe what that sounded like, you know. The steam came up and there was a kind of muffled sound – it was amazing. I can still remember that. And my father and I, well, he had a motor boat and he had the presence of mind to keep moving the boat up with the water as it came up. And it came up to our door sill. It was in the cellar and it came up to our door sill and we started to move the furniture to the second floor and then it went back down. 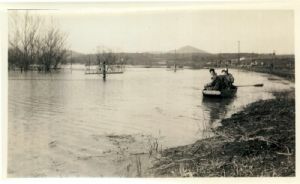 So at that point my dad said “Come on Jack, let’s go over to Williamsport” We got into the boat and that was amazing Like I said, the only way we knowed where to go, we followed the tops of the telephone poles, because the bridge was completely covered over. And when we docked over there in Williamsport it was at Joe Grove’s barbers shop, half way up what we called town hill. But you know, going over there, the creek was backed up and the river being swift and that’s what made it so deep, and I thought going over there, I hope this boat doesn’t sink. I could see how deep that water was. I could swim but… I was glad to get over there safe, you know. But it was awesome. And you know, over there on Clear Spring road it was up on the second floor of those houses.